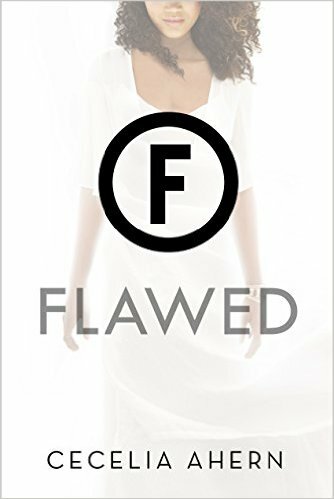 Flawed takes place in a society where anything other than perfection. When the Guild takes you in as a Flawed, you are basically a criminal. Celestine is perfect. Always has been and always will be. She was Perfect for one moment, but then...she was flawed. I really liked this book! The premise of the novel was interesting and the writing was very well done! The book flowed nicely and the characters were very interesting which I also very much liked! I would rate this book a solid 4/5! I definitely recommend it to anybody who likes Uglies by Scott Westerfield and I am really looking forward to the next book! It seems there will be two books in this series! So, this book was not perfect. it was a bit "flawed" Did you see what I did there? Okay, so first of all the connections between the characters in this book. Celestine and her boyfriend Art are all lovey dovey in the beginning of the book but as soon as Celestine goes inside her cell and sees Carrick she feels an "immediate" connection to him. I mean like come on! No chemistry what so ever! That was a big no no for me. Juniper! OMG I hate that girl! Even in the end when she was trying to get retribution for what she did, I still had a certain distaste for her. Okay, I did feel a teeny tiny bit bad but still! She should never had snuck out of the house with her little sister's boyfriend! That's like...breaking the girl code. The whole plot about the perfect society was good and everything and I liked seeing Celestine coping and trying to go back to her normal life. But I felt that the book could've moved on from that later on. Her goal was to find Carrick and supposedly start a rebellion but no, that doesn't even seem to happen in this book! I felt that Cecilia left this out so she has something to kick her second book off with but still, it would've been better if she wrote some more action in this book. Overall, this was a really enjoyable read, while it's not the best dystopian I've ever read, it's still enjoyable and worth your time!